Connecting people of all abilities through art creation is key to the My Muse Arts mission. We seek to provide programs that enrich lives by joining communities through interactive social activities. Join us at a local or international event and stay connected through creativity. My Muse Arts serves the community through program coordination of arts classes and events. Creativity supports people through personal expression, stress reduction and social inclusion. My Muse Arts seeks to provide opportunities for people of all ages to rediscover and nurture their creative selves in non-judgmental and fun environments. 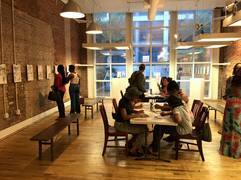 TeMika Grooms hosts monthly, low-cost meetups where even those who don't consider themselves to be artists can feel right at home. Typically the 3rd Sunday of the month, we meet at a local coffeehouse in the Atlanta area to gather over food, beverages and good ol' fashioned coloring books. The Retreats are specifically geared towards artists and writers and will allow Creative Minds to Connect, Collaborate and Create in natural settings amongst their peers. If you think you don’t have enough time, money or space to be creative, we have the solution. 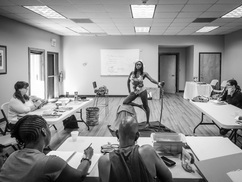 This year will include retreats to meet and exceed your needs for an Artist Playdate. Do you need an Artist Playdate and a little time to reconnect with your craft? Whether you are short on time or have more to spare, check out www.MuseArtsRetreats.com to find the programs we have available to inspire your work. We believe artists need to be physically, emotionally and spiritually nourished in order to create their best work. Muse Arts Retreats seeks to provides spaces for artists and writers to enjoy natural and/or culturally inspiring settings, while providing healthy food, guided activities and free-time to create. In a nutshell, we support you reconnecting with yourself through creative self-care.